I periodically share polling data, in part because such information tells us what people think, but also because this type of research warns us where we need to focus our educational efforts and also gives us guidance on better ways to frame our message. In recent months, for instance, I’ve gleefully noted that voters disagree with Paul Krugman on the economic impact of government spending. But I also was shocked to see another poll that found French and Italians were more supportive of spending cuts than Americans. Here’s some new polling data that seems very encouraging. 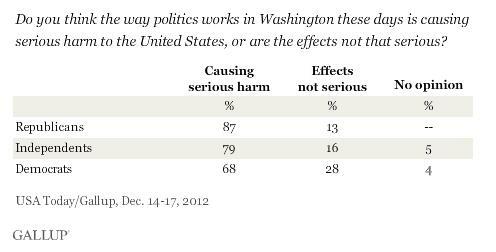 Americans, by an overwhelming margin, think that Washington is causing serious harm to the nation. But it’s important to look at this data dispassionately. Maybe people merely object to gridlock, meaning that it would be a mistake to interpret these results as being a reflection of widespread libertarian sentiment. So it’s important that advocates of freedom build upon these polling results to educate people about the risks of giving more money and power to a dysfunctional town. The good news is that we do see significant skepticism about policies to expand the size and scope of the federal government. I recently shared some data showing that most Americans wisely suspect that higher taxes would result in bigger government rather than less red ink. I also found similar results in a Reason poll from 2011. That same poll also found strong support for a limit on federal spending, which warms my heart since I’ve been trying to build support for a Swiss-style spending cap in America. Here are some other encouraging pieces of polling data. More than two-to-one support for personal retirement accounts. Recognition that big government is the greatest danger to America’s future. An increasingly negative view of the federal government. More than eight-to-one support for less spending rather than higher taxes. Strong support for bureaucrat layoffs and/or entitlement reforms instead of higher taxes. Three-fourths of voters think the top tax rate should be no higher than 30 percent. And my favorite poll results are the ones showing that voters understand that the goal is less spending, not lower deficits. But let me close by stating that our goal is to preserve the freedom we have and restore the liberties that we have lost. Public opinion data is useful in that it tells us how people think and suggests ways to frame our message. But it should never cause us to change our principles. I agree with Zorba. This Poll just proves that the average American is an idiot! They want less spending and/or spending restraint but they vote for Obama? Obviously, MittRom wasn’t a much better choice. Personally, I think it really hurt Romney that he didn’t attack spending at every opportunity. We all know why, because he’s a spender too! The proof is in the pudding. What matters most is not what Americans respond to polls, but how they vote. After all, as Mr Mitchell mentions, Italians and the French also favor reduction in government spending, but vote otherwise. American voting mentality is irreversibly becoming European (it’s not coincidence that voters of virtually every European nation have fallen for the same prosperity through state welfare message), their economic trajectory will inevitably follow the same irreversible pattern: DECLINE.